What is the 800 Pound Gorilla Doing? By now everyone is scratching their heads wondering what the 800 pound gorilla is doing. Well Google is releasing 3 updates. That’s right 3. There is the Penguin 2.0 Update Update (that’s right they are updating the update), Payday Algorithm Update, and their monthly Panda Data Refresh. Your probably wondering why so many updates and what this means to you. So let’s go over each update and how you can mitigate your position. One thing you need to keep your eye on is to follow the money. Google is an advertising platform. They make money on Pay-Per-Clicks. There is a fine balance they have to play and they know this. Good sites have SEO budgets, these budgets pay for links. Killing too many good sites means horrid search results. With the Bing-it-On challenge, they can’t afford to lose faith in their product. On or around April 24, 2012 Google started rolling out the Penguin 2.0 update. What was curious is that Matt Cutts said it was coming in May. When the SEO world started making noise about it he said; oh yeah we did the update. Makes me wonder why it always appears that the left hand does not know what the right hand is doing. This is not the first time Matt Cutts appeared to be unaware of what was going on. This update was supposed to address the original goals of Penguin which was to give more credence to thematic sites. That the inter thematic linking of topics would help sites rank better. As Google said, create content not links. But apparently this has not really worked as well as they have promoted. The hype does not pay off immediately, we find that content takes roughly 3 weeks to get deeply indexed before it shows up for long tail searches. Penguin also addressed links. The whole premise was: if a site gets a lot of links from a single domain, then it must be buying links. This was fine and dandy because it appeared that Google was only looking at new links. Well, the 2.0 update went deep, the long pass, it took into account all the links each site had all the way back in its history. And yes, lo and behold, lurking in the past were many gremlins of links-gone-by that are now biting webmasters and SEOs. Many sites had cross-linked pages. Others had Negative SEO links waiting to be discovered. Either way, these links need to come down. We are addressing this by adding sites to our Google Webmaster Tools and disavowing these links. We can usually get the issue resolved in 2 to 3 weeks. This also depends on the gorilla’s cooperation. So why is it an Update Update? In a roundabout way, Matt Cutts said, Oops. The search results after the update were dismal and Google got a lot of flack. So they are rolling out a “gentler” Penguin 2.0 update to restore some of the great sites that vanished. A lot of sites that got nuked are now appearing on page 2 for results where they once were in top 5. A horrible side effect of Penguin 2.0 is that it exposed a bug. Aside from returning dismal search results, a deep linking trick is now ranking sites and black hatters are having a field day. Hence the Payday Algorithm Update. The reason for this update was because Matt Cutts was embarrassed and Google got egg on their face. So now they are calling them “spammy queries.” That has got to take the cake. I believe there may still be some room for correction, but bottom line is why not be proactive and get this junk cleaned up. Algorithmically, link diversity trumps link volume. Link Diversity is an Inverse Index. The Holy Grail is a diversity index of 1. The bigger the number the worse it is. It is a simple formula of dividing the total number of links by the total number of referring domains. Get a hold of us and schedule to get your site added to our Google Webmaster Tools. We will do an historic back link profile and clean up your links. We have always believed in playing the game as the game is played. If the rules change, we change and adjust. There has been a lot of outright sabotage. Some of your competitors don’t play fair. We have found 7 cases of direct sabotage. If your site has been affected, get a hold of Racquel Peña. We can pull your site out of purgatory. Contact Racquel Peña by email at racquelpena@gmail.com She will work with you through the process of getting your site added. We can then do an inventory and correct any problems you may have. The fee is $150 per website. We have tested this bug with great success. However, we have not used it for any client sites. We feel that it is a gray area and are hesitant to open this to our clients lest something like this happens. 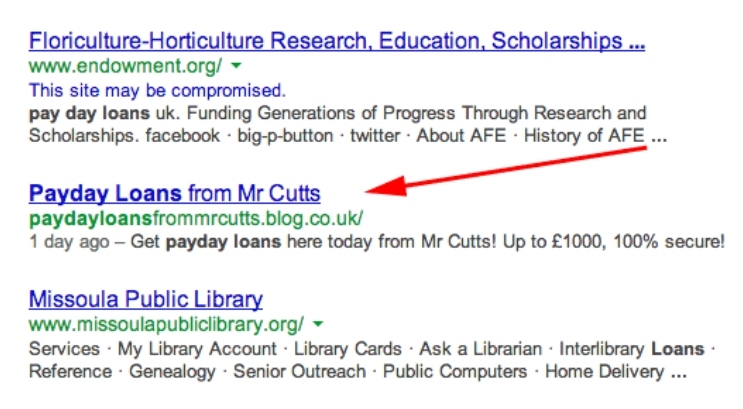 Additionally, if you look at the results they are the furthest from being relevant to a Payday Loan in the UK. Some issue with the Geo-Targeting you think? Hence the Penguin 2.0 Update Update. The American Floral Endowment in Alexandria, Virginia and the Missoula Public Library in Missoula, Montana are hardly related nor relevant to the search term [payday loans] in the UK. The site “paydayloansfrommrcutts.blog.co.uk” ranked on Exact Match Domain (EMD), Geo-Targeting, Deep and Direct Linking techniques with a Diversity Index of 17.52. This is not good for EMD sites. I fear there may be fallout. Don’t hold my feet to the fire on this one. I am just as paranoid as you are. There are many ways this technique can be done. It is basically a concept of PageRank aggregation. In the past you may recall all the “Top Site” websites. They required you to add a button on every page of your site. These were link aggregators. As per Google’s Anti-Spam Guru this Update will be multifaceted and span up to 2 months. As mentioned earlier, this Update may affect Exact Match Domains (EMDs). We are in for a ride. Direct Linking is what we do for you. This is the “legal” way to get links. It is traditional, time tested and the very foundation of Google’s core algorithm. Larry Page will have to croak before they remove this facet. On Deep Linking, absolutely nothing. We doubt that there has been any deep linking done to your site. It is an expensive proposition. We doubt that unlike the sabotage we have seen, that anyone has gone through the process of deep linking you. We have a test site up. We are keeping our eye on it. We believe this is going to be a tough nut to crack. Not that it is impossible, but it will take considerable processing power to go through 5 billion plus pages. As they said, it will take up to 2 months to correct. So hold on to your seat. On Exact Match Domains, you will need a big link portfolio to weather this one out. This is where a big diverse link portfolio can shield you from possible EMD fallout. Since part of Penguin was to give EMDs more prominence, this update may affect sites with low link counts and poor diversity. Now is a good time to increase your monthly link service to bring your Diversity Index down. Some folks just don’t learn. I understand that change is hard but SEO is an industry in constant flux. Article submissions and Blog networks are the kiss of death. Panda is now a monthly update that is spread over 10 days each month. The problem with this penalty is that anyone that has engaged in this activity will see grief for a long time. Why? Simply due to the fact that these articles have been replicated thousands of times. Links in these articles get vested over time. Removing the source does not remove the replicated copies. And the insidious thing is the replicants get replicated. This will be a continuing issue that needs to be addressed on a monthly basis. This means close monitoring of link portfolios because these copies eventually get the link vested back to you over time. Almost like the gift that keeps giving. I know this isn’t funny if you are affected. There was a reason we avoided all this. This was a Webmaster Guideline violation right from the get go. If you have engaged in this activity get a hold of Racquel Peña ASAP. Email her at: racquelpena@gmail.com. If you are not already added to our Google Webmasters tools, let her know. We will monitor your link portfolio on a monthly basis and catch any new article links being credited to you. We will then either get them taken down via Digital Millennium Copyright Act Takedown (DMCA Takedown) or disavow them. Disavows are a temporary fix because these things are like mushrooms that keep popping up. The DMCA route is more expensive but is a permanent solution. What does it cost? Monthly monitoring and disavowing is $125 per month. DMCA takedowns are $10 a Takedown. This is actually a steal since the going rate is $199 per Takedown. Sure, but there is not enough room in this News Release to cover all the aspects of ranking your site. Nor is this the venue for putting out our speculation as to what Google’s frustration may result in. If you want more info contact us. I personally will be out of touch for the next 2 weeks. But send us an email and we will respond to you mid-July. If you need immediate action on your site, contact Racquel Peña racquelpena@gmail.com.